Safety and speed of pneumatic operation with the accuracy and controllability of hydraulics. 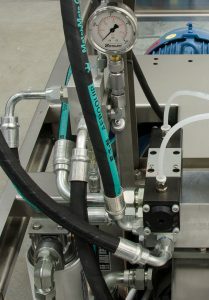 Air controlled hydraulic pressure control valve uses an external pneumatic pressure control signal to proportionally and/or remotely control hydraulic pressure. 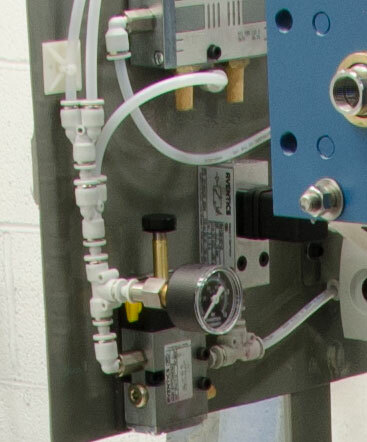 Air controlled pressure controls provide the same function/performance as hydro-mechanical or electro-mechanical controls, but are adjusted by a controlled air pressure rather than a mechanical screw or electrical current. 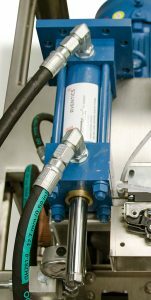 Pneumatics offer an advantage over electro-hydraulic devices operating in environments when very strong electromagnetic fields are present. Electromagnetic fields can send electronic noise to low-level electric control wires thus sending false signals to sensitive electro-hydraulic devices such as proportional pressure valves. Devices requiring variable hydraulic pressure and complete isolation from other parts of a machine pneumatic controls offer a practical solution. In this case, the pneumatic control lines can be rubber or elastomeric tubes and are thus an electrical insulator. When working in hazardous environments involving combustible or explosive materials, pneumatic controls can meet safety requirements, often at a lower cost of required explosion proof equipment and wiring. From the food processing equipment to industrial equipment, Advanced Fluid Systems can develop a solution to fit your needs. Contact us to arrange a consultation with one our highly-qualified sales engineers.